If yes, when did you start it? What’s on it? Has it changed over time? And if not, have you ever considered coming up with one? Why or why not? What might you put on it, if you were to start one? A few days ago, several of us stood under the shade of trees by our Redeemer parking lot, with cans of spray paint, large white stencils and five 4′ x 8′ boards at our feet. Our fearless leader: Phyllis Taylor. Our task: To make our very own “Before I Die Wall” for Party in the Park in celebration of Hope, Healing & Heritage this Saturday in Lafayette Square, in collaboration with St. James Episcopal and other nearby churches. 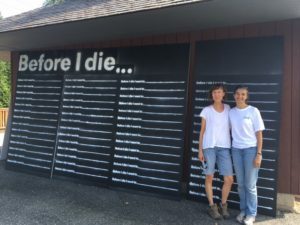 The idea behind “Before I Die” is the same inspiration behind “bucket lists”: an invitation to shine a laser-like focus on what’s essential in our lives. Given the precious, limited time we have to live as human beings on our planet earth, how best to spend the time we’ve got? But what does contemplating our lives and our mortality have to do with hope and healing, you ask? Hope and healing, in our own, individual lives? And hope and healing, collectively, as a city? Hurricane Maria strengthens again… Mexico searches for earthquake survivors against increasing odds… Crucial American financial institutions hacked… Record flooding in Houston… Five murders in Baltimore this week, 230 for the year… Is it just me, or does it feel like a good time to be reading The Book of Job? Job poses some of the most difficult questions for us: Why do bad things happen to good people? Is the universe orderly and just? Is God looking out for humanity? Does it really matter how we behave? The Book of Job is really two books: a prose frame story in chapters 1, 2, and 42 and 39 chapters of poetry in between. Most scholars agree that the framing narrative records an oral folk tale, which had been circulating for centuries and was told in several cultures. As a sustained protest in poetic form, the middle portion of the book resembles no other text in the Biblical canon. Theologically, it is a radical challenge to the doctrine of “reward for the righteous and punishment for the wicked,” and as such, the unknown author is working alone—“a bold, dissenting thinker, a poet of genius who produced a book of such power that Hebrew readers came to view that they couldn’t do without it.” (Harold Kushner) Job gives voice to our agony: How can it be that a God who is good has created a world with such pain? Job deals with the problem of theodicy—the defense of God in view of the existence of evil—so while ordinarily we put human beings on trial as perpetrators of violence, in this case it is God who is on trial. Russell Baker, a nationally syndicated columnist, wrestles with this idea in his autobiography Growing Up. As a five-year-old playing with friends in the woods, Baker suddenly learns that his father has died. Baker lost more than his father that day. For us in Baltimore and those who struggle hard everywhere, I wonder how to navigate through pain without losing ourselves in the bargain? How do we not lose hope? How do we not lose God? How do we keep on keeping on? Join me on Thursday evenings at 6:00 or Wednesday mornings at 10:00 for the Rector’s Bible study, especially if you don’t know too much about the scripture, especially if you thought you’d never study the Bible, especially if you gave up on God a long time ago. Whatever we have lost, God has come looking for us. A blessed residual effect from my Sabbatical has been an ongoing awareness of being more attentive to small happenings that cross my life’s threshold. When experienced only as solitary events, they can come and go without much notice but when added together, they become like a string of pearls that hold their own beauty. This past week has provided a cluster of events and interactions that are strong reminders of Holy Ground that is the foundation of this parish. Let me offer a couple of examples. Sunday marked our opening day for the program year. There was a palpable sense of The Holy Spirit moving through the sanctuary as individuals of all ages arrived, excited to begin again. It was particularly moving to see the numbers of children and youth enthusiastically being a part of the day. Following the service the congregation recessed to our front lawn where there was feast of homemade barbecue, and coleslaw made by Troop 35 and then desserts provided by the parish. And a wonderful addition to the festivities was live music. But there were other layers that were part of our opening day. As I greeted a young family with their children, they introduced me to the wife’s in laws. Oh I said cheerfully, ‘where have you come from’? There was a momentarily awkward silence. The grandmother replied with a solemn voice, ‘we have evacuated our home near Tampa due to the hurricane’. My heart sank as the news earlier that morning was not good for Tampa. She added ‘we do not know if we will have a house when we return’. I was struck by the dichotomy of this family’s pain and worry while our parish was in such a festive mood. I asked if I could call her Monday to see what news they might have heard. Thanks be to God, the news on Monday from them was very positive. How full of Grace however that they were able to worship with us in their time of anxiety. During the service, a member of the congregation experienced a medical emergency. Immediately the ushers notified several doctors who were in worship and ultimately 7 physicians and a nurse responded. The individual was taken to the hospital and the good news is that he is now fine. How reassuring that he was attended to so quickly and professionally. Saturday our own Joanne Tetrault will be ordained as a priest at the Episcopal Cathedral at 11 am. All are welcome to attend! Needless to say, this is the pinnacle of her journey as she has responded to God’s call on her life. And then this coming Sunday, Bishop Sutton will be with us at all 3 services. During the 10 am service, 12 adults will be presented to him for confirmation, reaffirmation or to be received into the Episcopal Church. This is another ‘outward and visible sign’ of God working within this congregation! It makes me wonder about what lies ahead for next week! When I was a freshman in college, the most effective communication strategy involved “table tents”: little signs made of folded pieces of heavy paper, which were placed in dining halls all over campus. These tiny billboards advertised everything from musical theater to keg parties, and they changed almost daily. Sitting alone we digested them silently, and when a raucous group sat down, the information on the signs shaped both our conversation and our social plans. By sophomore year, groups were stapling 8 x 11 sheets on every available tree and pole, and by senior year huge signs were fastened to the walls of buildings. We are always looking for better ways to connect with each other and promote what’s going on, and in these days of Twitter posts and Instagram and curated Facebook pages, I admit I’m a little nostalgic for those humble handmade signs. Twelve years ago, the students at Northwestern University took a similar tack. They had e-mail accounts and social media, but they also began to post important statements on bed sheets: spray-painted eye catchers hanging out of windows. In that spirit, the new rabbi in charge of the University’s student fellowship, Hillel, decided to put up a banner advertising Yom Kippur services. (Yom Kippur is an annual Jewish holiday set aside for confession, atonement, and starting over on a new foot.) But instead of announcing the date and time of services, he decided to try something different: he printed “What will you do better this year?” on the banner. And then something unexpected happened: Students told him that the banner sparked conversations about the question. And they suggested that Hillel make more banners. “Ask Big Questions” began with a pretty simple idea—to ask a question instead of making a statement—and it has sparked something important on 28 college campuses nationwide. Asking a big question rather than offering an answer inspires conversation and engenders mutual respect, two things we need more of, now more than ever. How can this year be better than the last? What value do you stand on? What does every individual need? As we begin the 2017-18 program year, staff and volunteers have created myriad opportunities to pose these questions (and others!) and foster the kind of community that can begin to answer them. Check out the service leaflets, bulletin boards, website, and e-redeemer posts for speakers, studies, musical events, worship and more. What question does this year pose for you?